Just a few days ago a Kung Fury went viral online and is loaded with awesome 1980s throwback. The half hour movie was crowd-funded for an amazing $630,000 on Kickstarter and is pure B movie genius. There must have been something in the water during the 70s and 80s that produced such great inspiration material. I really thing Kung Fury is a great homage to the nostalgia of the old school. Ambusher. The laser raptor has advantage on attack rolls against any creature it has surprised. Bite. Melee Weapon Attack: +6 to hit, reach 5 ft., one target. Hit: 15 (2d10 + 4) piercing damage. Laser Eyes. +6 to hit, range 300ft., one target. Hit: 14 (3d8) radiant damage. While it only has animal intelligence the laser raptor has an innate instinct to use its ranged attack. The laser raptor as the name suggests is incredibly fast and can easily distance itself from melee combatants. 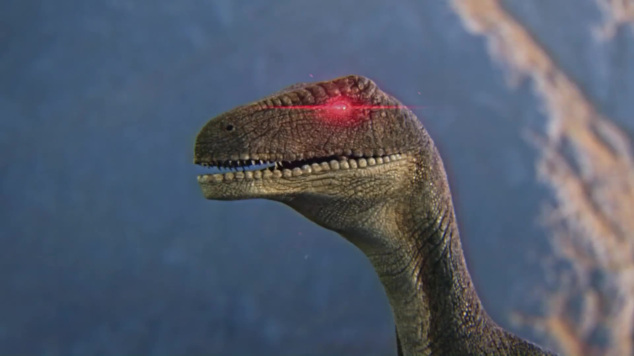 Occasionally laser raptors will work in small groups of 2-4 if they are hungry and want to take down a large target or tasty looking group of adventurers. Player Notes: If you encounter a laser raptor it is best to stay still as they react to movement. Should combat ensue close the distance with the laser raptor or your character will become a french fried memory. Additionally you may have angered your Dungeon Master since your character is obviously now in some strange prime material plane. Groveling won’t help so roll initiative and hope that your lobby DM roll ends up getting you backup from Barbarianna!